In this paper, we re-examine the change in persistence hypothesis for inflation, using data from Noriega et al. 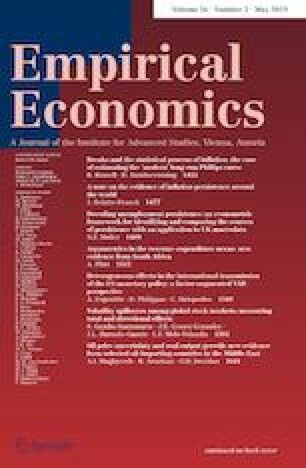 (Empir Econ 44:1243–1265, 2013) and the new testing procedures by Kejriwal et al. (Econom Theory 29:289–323, 2013). Our results display more evidence of change in persistence than Noriega et al.’s paper, with some remarkable conflicting conclusions with respect to their work, although results depend on the measure of inflation: seasonally adjusted, trend-cycle component or interannual. I acknowledge the useful comments of an anonymous referee.